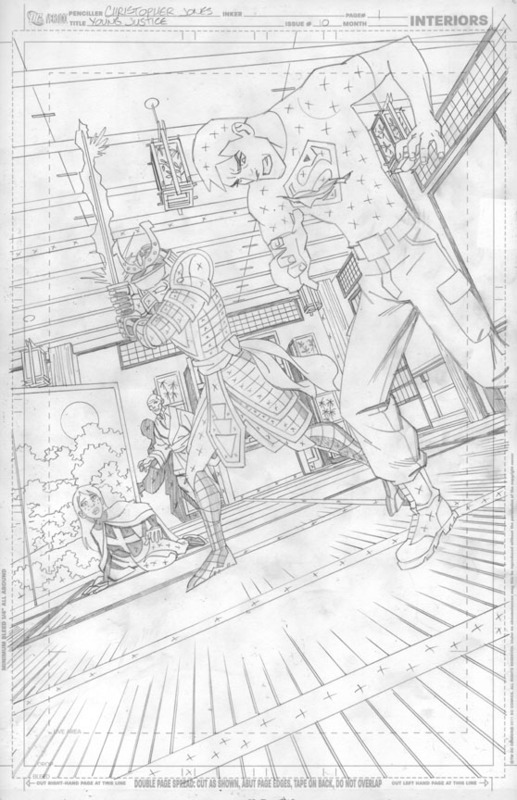 Original Young Justice Page Art for Sale! 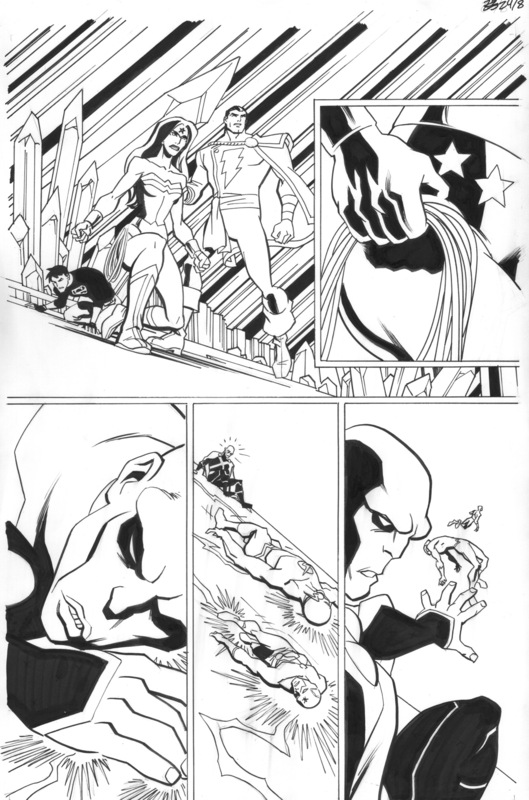 Three pages of my original Young Justice art are now for sale on eBay. 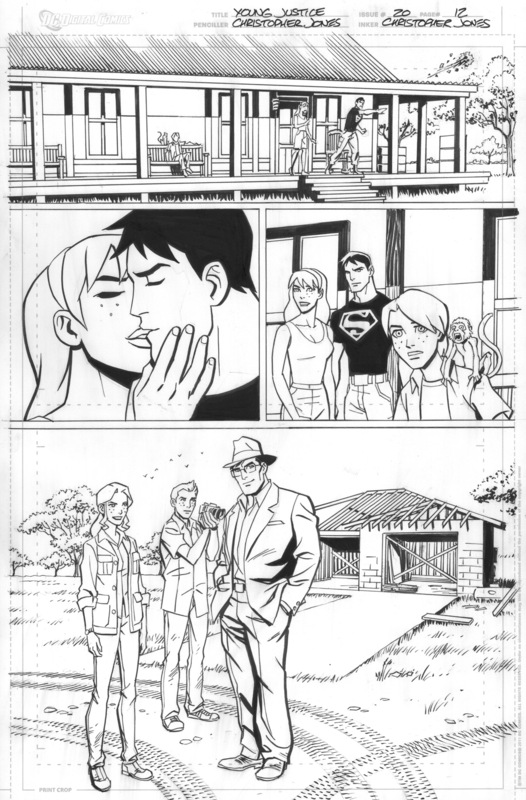 These are original interior pages from DC Comics Young Justice series, the companion comic to the popular Cartoon Network Young Justice animated TV series. This is original, hand-drawn 11″x17″ page art by Christopher Jones. 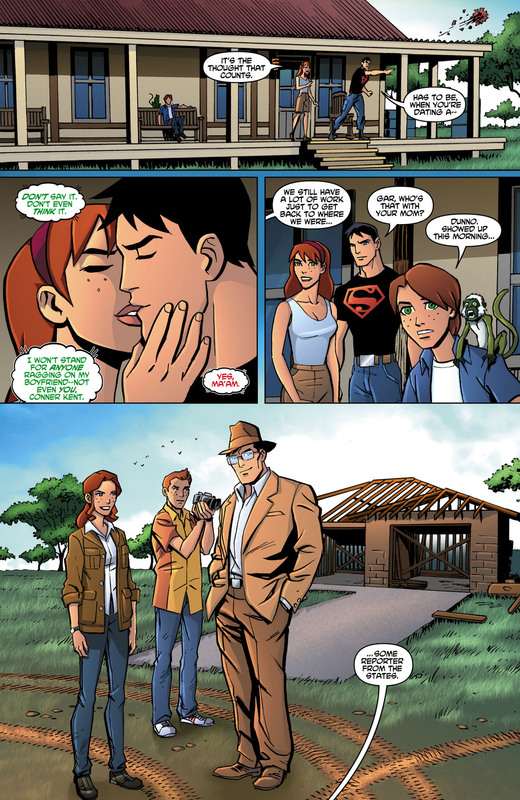 Featuring a nice kiss between Superboy and Miss Martian, as well as Superboy’s introduction to Clark Kent. The page also features Garfield Logan, Marie Logan, and Jimmy Olsen! 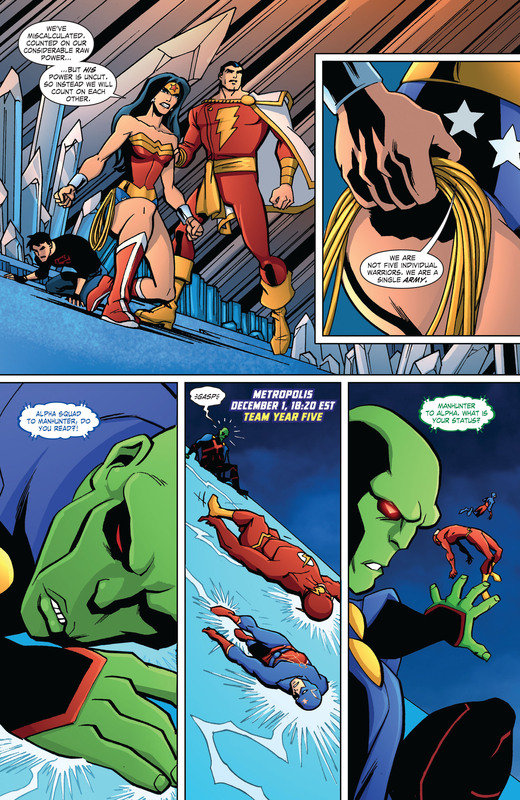 Featuring Wonder Woman, Superboy, Captain Marvel, Martian Manhunter, The Flash, and The Atom battling the alien villain Kylstar. 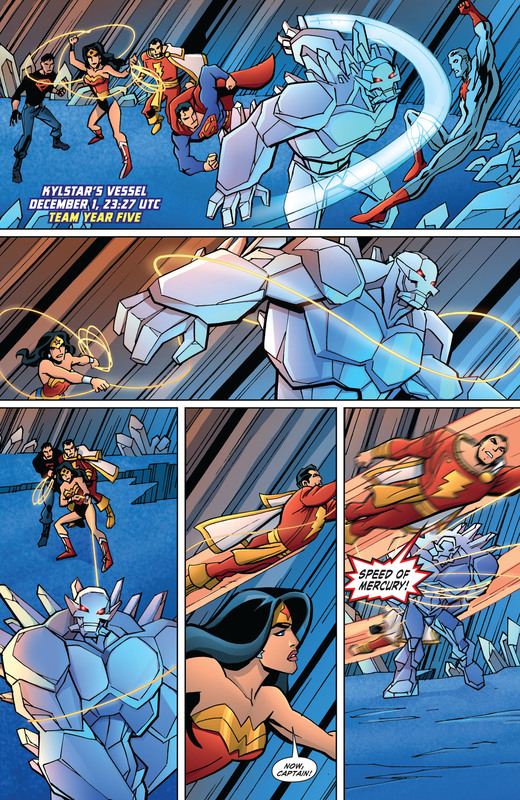 Featuring Wonder Woman, Superman, Captain Atom, Captain Marvel and Superboy battling Kylstar. Auctions end Sunday August 18, 2013. 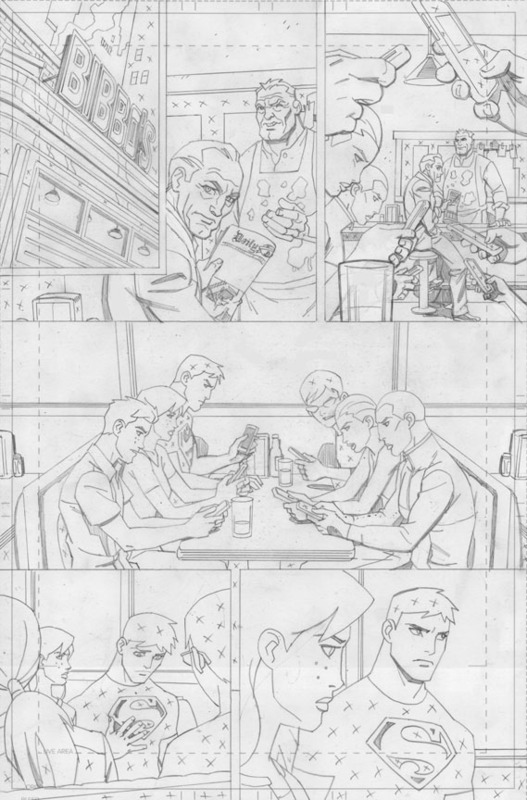 Misc Artwork, Young Justice | Christopher Jones | August 11, 2013 8:29 pm | Comments Off on Original Young Justice Page Art for Sale! Young Justice Volume 2: Training Day – IN STORES NOW! Hey, the second collected edition of my Young Justice series hit stores this past week. Following the first volume which collected issues #0 – #6, Volume Two has a cover price of $12.99 and is chock-full of Young Justice goodness by writers Greg Weisman and Kevin Hopps, pencils by Yours Truly, inks by Dan Davis, colors by Zac Atkinson, and one issue drawn by guest artist Luciano Vecchio. Based on the animated show from Warner Bros. airing on Cartoon Network, Young Justice collects single issue, all ages appropriate stories featuring the popular characters from the hit Cartoon Network show. In this volume, Superboy, Robin, Kid Flash, Aqualad, Miss Martian and Artemis defend Gotham City from Batman’s biggest foes Ra’s al Ghul and Clayface while also fending off Professor Ivo’s malevolent MONQIs! And that doesn’t even mention appearances by Talia al Ghul, Ubu, Sensei, Amazo, Green Arrow, Rako (The Cambodian!) and Captain Atom! 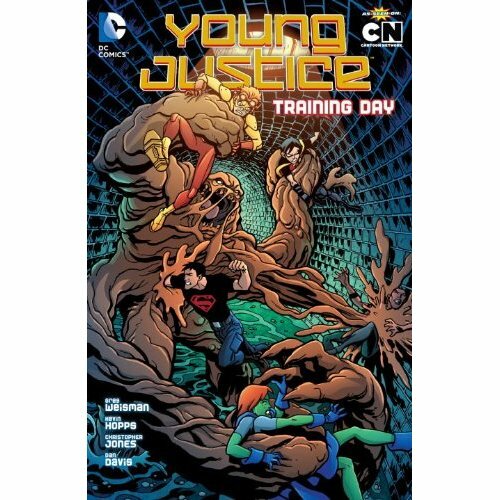 Young Justice | Christopher Jones | November 18, 2012 10:00 am | Comments Off on Young Justice Volume 2: Training Day – IN STORES NOW! It’s the long-overdue return of my Creating a Cover series! I promise I’ll go back and fill in the issues I’ve skipped, but I wanted to do a piece on cover for the just-solicited Young Justice #23 as it seems to have generated some interest. This is the “proof of concept” sketch I submitted for approval, based on email discussions with my editor Sarah Gaydos and series writer Greg Weisman. I posed Kylstar as similarly to Captain Atom as his very different proportions would allow. I also brought his hand up into the shot to further mimic the Captain Atom image. Having his hand in the frame also gave me more facets to play with for images. 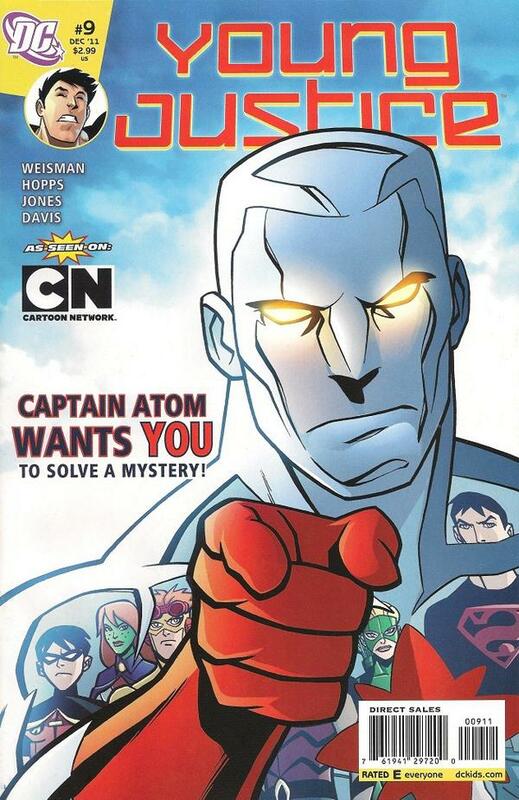 On the Captain Atom cover I had one image of the team reflected across his body. 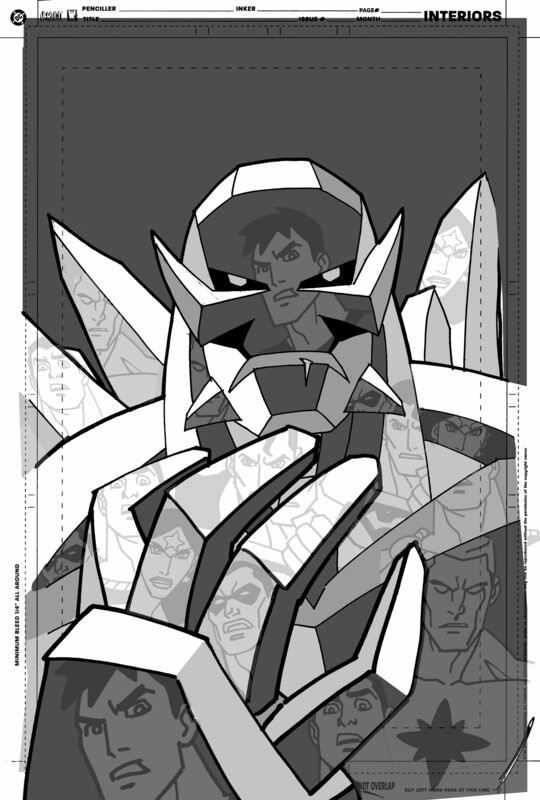 With Kylstar, I thought it would be fun to have fragmented images of the heroes repeating across his various facets. I wanted to strategically feature good reflections of the heroes, but then fill other facets with random fragments of reflections. I didn’t want this to become a flat, two-dimensional mosaic of reflections, so I planned the shot to use edge lighting on the facets at fairly oblique angles to bring out the dimensionality of the Kylstar figure, while using the facets facing us more flat-on for the reflections. This concept was enthusiastically approved, so it was time to actually draw the cover! Notice that I repositioned Kylstar slightly in the finished artwork. The changes are subtle, but I was trying to maximize the dynamics of the composition. I made more obvious changes to what reflections went where. You can see that some portions of this artwork are in black and others are in grey. 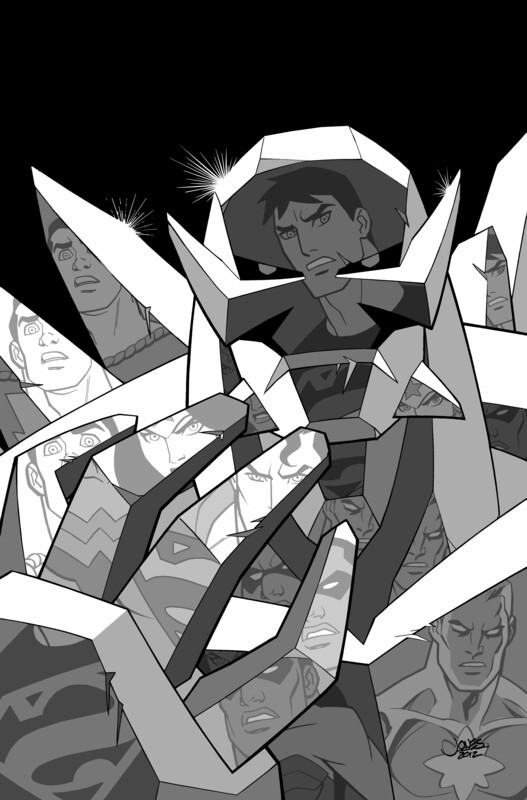 The black image featuring Kylstar was drawn as one piece of artwork, and the reflections of the heroes seen here in gray were drawn separately. This allowed me to play with the placement of the reflections and have bits of the reflections repeat on different Kylstar facets. The artwork was submitted to colorist Zac Atkinson with the reflections as a separate layer, hopefully making it easier for him to work with them at the coloring stage. Or at least giving him the option of isolating them more easily, depending on his process. I wanted to make sure that my original intent for how this should be treated tonally was communicated, so I applied the approach from my original proof-of-concept sketch to the inks to create this reference guide which I also sent to Zac. Here is the stunning result of Zac’s coloring. I especially love the treatment he gave to Kylstar’s eyes. I’d originally imagined them a cyan color, but I think the burning yellow-orange makes for a great contrast with the cool blues of the rest of the image. 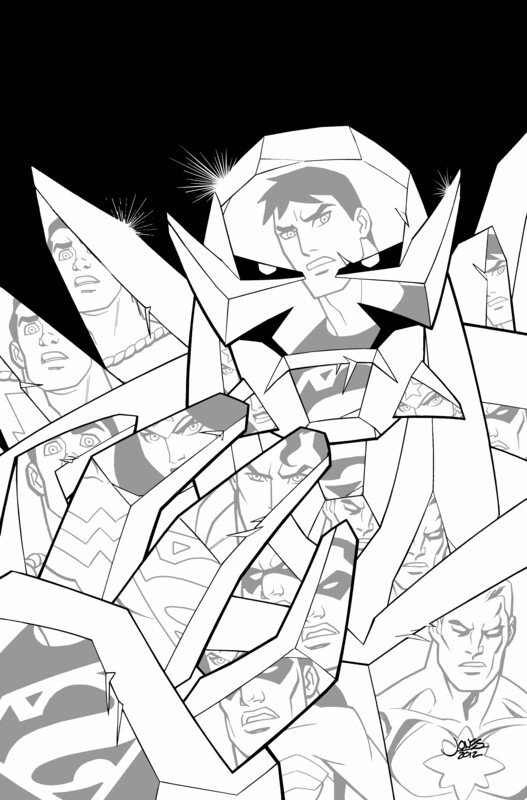 Look for more of Kylstar in coming issues of Young Justice! Issue #20 will be out THIS WEDNESDAY, which represents the comic’s shift to the Season 2 / Young Justice: Invasion time-frame. You can find Young Justice at your local comics shop or in digital form! Hi everyone! Sorry I haven’t posted for a while. I was super-busy for a few days and then had an internet outage. But I’m back, and raring to go! Here’s my commentary on Young Justice issue 10, part two of our murder mystery featuring Captain Atom! I’m including samples of a few pages of artwork here, but I’m commenting on close to every page, so grab your copy of the comic from your local Comic Shop or your digital copy and read along! Page 1: It’s funny how the successive stages of completing a comic book page make a page look simpler and simpler. The background for these opening pages seemed really busy with detail when I was penciling them. Of course, you have the texture of the pencil lines, and black areas are either filled with X’s or shaded in, as opposed to the smooth solid blacks you get when the artwork is inked. Then when the artwork is colored and the background is colored in muted tones so the figures stand out, what once looked seemed like a lot of time-consuming detail just fades into the background and is easy to not even notice. Greg Weisman has started listing me as “Christopher A. Jones” in the credits section of his scripts. Now it’s actually shown up in the credits on the comic. Now my middle initial IS “A,” but I try to keep my credit consistent. It’s been mentioned to my editor, but won’t be fixed until after issue #11. So if you are blogging about comics or moderating any kind of index or gallery or forum – I’ve been listed as Chris Jones, Christopher Jones, Christopher A. Jones, and Christopher R. Jones in various places and on various books. “Christopher Jones” is the preferred credit, and the “R” is flat out wrong. You’d think with a name like mine it would be simple, wouldn’t you? I wonder what kinds of problems Bill Sienkiewicz has? 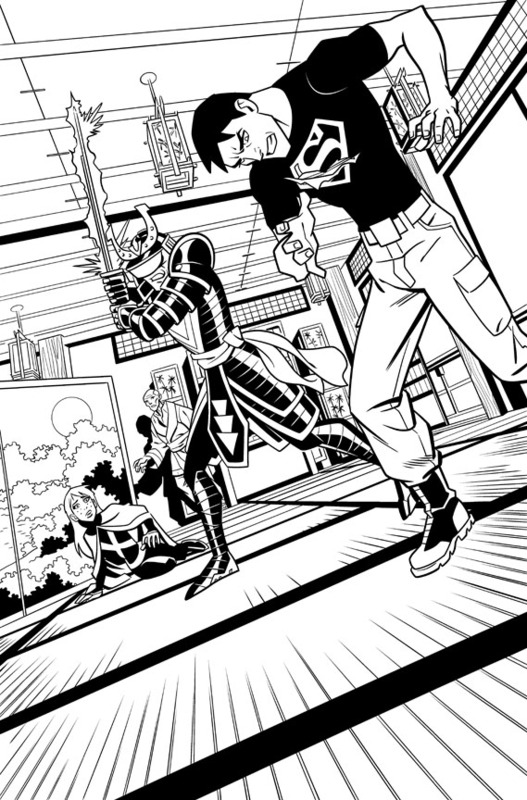 Page 2: In combat with Rako, the Artist formerly known as the Cambodian. I think I’ve been drawing the characters in their stealth costume variants more than the standard versions. Page 4: I like the moody last panel with the silhouetted heroes looking on the scene of Robin crouching over Trang’s body. And the body count for this story continues to climb! Page 5: Bibbo! 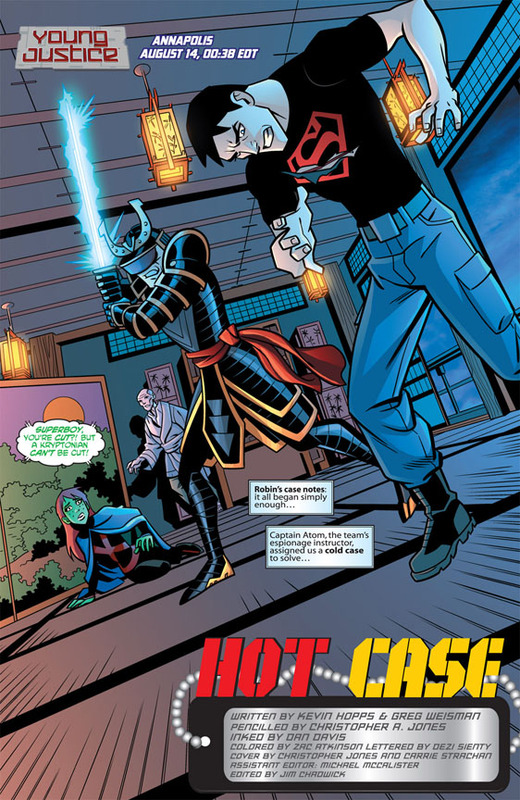 This supporting character from Superman comics runs a Metropolis diner in the continuity of the Young Justice animated series. And yes, that’s Perry White at the counter. Page 6: Cell phones, headshots, and fingers. One of the most pulse-poundingly dynamic pages I’ve ever drawn! Page 7: How many ways can we show characters looking at pictures on their smart phones? From panel-to-panel it was a question of whether the reader had to see what was on the phone, and how large I could make the picture on the phone while showing who was holding the phone and allowing enough room for dialog. Page 8: BOOOOM! The body count continues to climb. 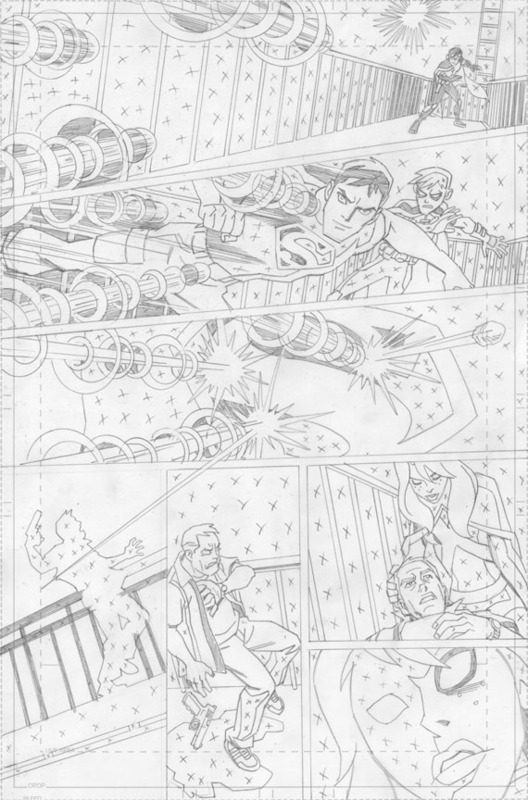 Page 9: It was nice to draw Kid Flash doing his stuff. I’ve drawn remarkably little of KF moving at high-speed six issues into my run on this title. Page 10: Halfway through part two of the story, the mystery-solving is largely out of the way. Let’s get ready to rumble! I’m going to share a trick with all of you. Whenever possible, it’s nice to keep backgrounds simple. For one thing it actually serves the story by keeping the reader’s eye focused on the action of the page, and for another more self-serving thing for the artist, it makes the pages faster to draw. But backgrounds ground the story in a specific reality, give the story texture and can provide story information in their detail. What to do? My preference is to open a scene with a detailed establishing master shot, hopefully providing bits of distinctive detail that can be repeated throughout the rest of the scene to continue to establish the location, but without having the repeat the complex opening master shot. Case in point, panel one of page 10 has a detailed exterior establishing shot of an abandoned airport hanger. 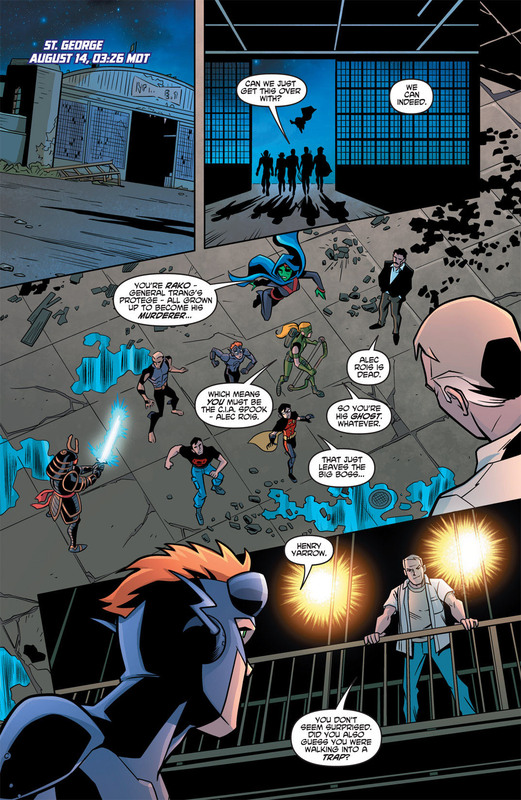 Panel two moves us inside, and the rest of the page shows the silhouetted windows, the grubby floor, and the catwalk where our villain is standing in front of some overhead lights. Notice how those elements repeated over the next few pages are enough to maintain our sense of this place, but rarely do we see more than a reference to the detail established on this page. Page 12: It’s not related to the artwork, but I just wanted to mention how much I love the way Robin laughs when he disappears into the shadows on Young Justice. To me it’s a callback to the earliest kid daredevil incarnation of the character. Greg Weisman told me that he figured Batman would have taught Robin his disappearing trick, but that as a 13-year-old kid Robin would think it was so cool he’d just laugh as people freaked out over his disappearance rather than just keeping his trap shut like the old man! Page 13: It’s interesting the kinds of things you learn how to convey in a line drawing. The script called for Artemis to fire an arrow at Rois who is holding a dead-man switch. The arrow is tipped with a canister of foam that expands up Rois’ arm and hardens so that by the time Kid Flash plows into him in the final panel on the page, it’s a hard shell covering Rois’s entire arm and part of his torso. It’s largely about texture – trying to make the foam initially gloppy with curvy smooth lines, then more angular and chunky-looking as it hardens. Page 14: I’m really happy with the first three panels on this page as Aqualad takes out Rako with his water-bearers, but even while I was penciling it I realized that Rako’s sword and Aqualad’s water weapons are all colored cyan blue and were going to all run together a bit in this action sequence. Hopefully it plays even though the action is a bit monochromatic. 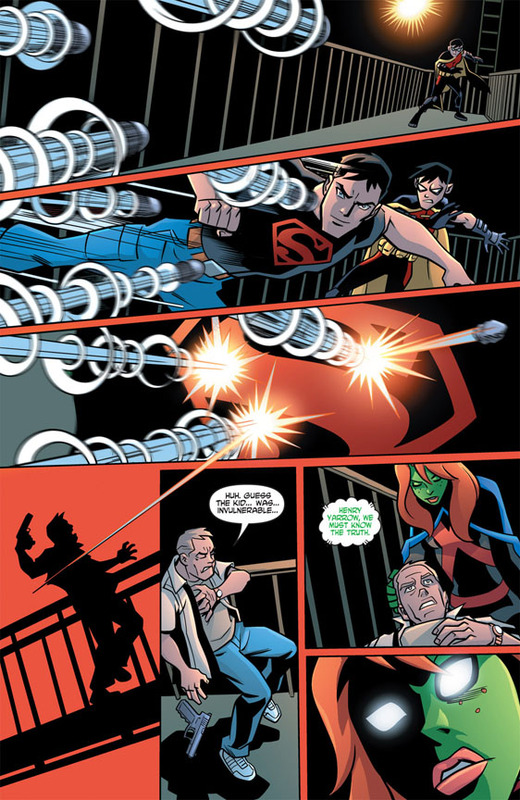 Page 15: Superboy gets to play the faster-than-a-speeding-bullet game. 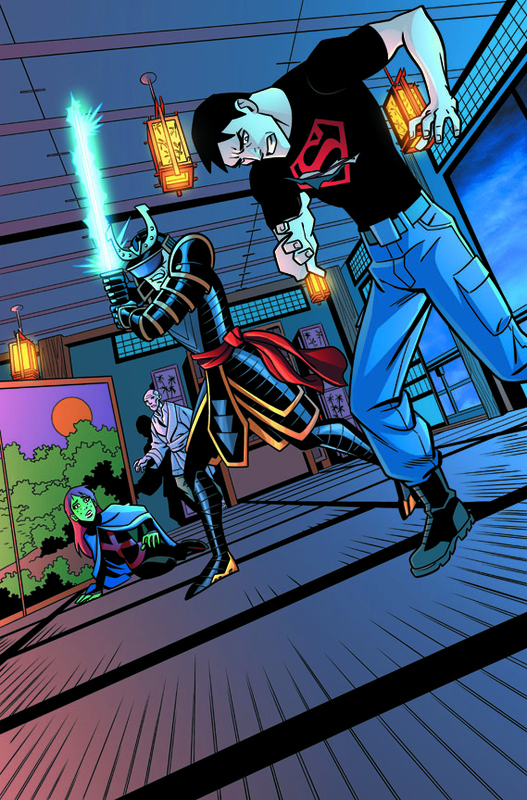 I had to show one of the bullets bouncing off Superboy’s chest and hitting the shooter. I was really happy with the layout I came up with that draws a direct line from the point of impact on Superboy’s chest in panel 3 through a silhouette of the shooter in panel four. I had hoped the silhouette would make the action clear without having to show any kind of wound that I knew would cause problems with the folks that worry about the all-ages nature of the Johnny DC titles. I was especially happy with how this worked with the red background provided in the color version. Page 16: Back to Mount Justice to explain the solution to the murder mystery and wrap things up. I just drew headshots for these holo-displays and unfortunately they didn’t get typeset captions at the lettering stage. The dialog makes it clear who everyone is so it’s not a huge problem, but it makes me think that next time I need to typeset that stuff myself like I did the previous issue. 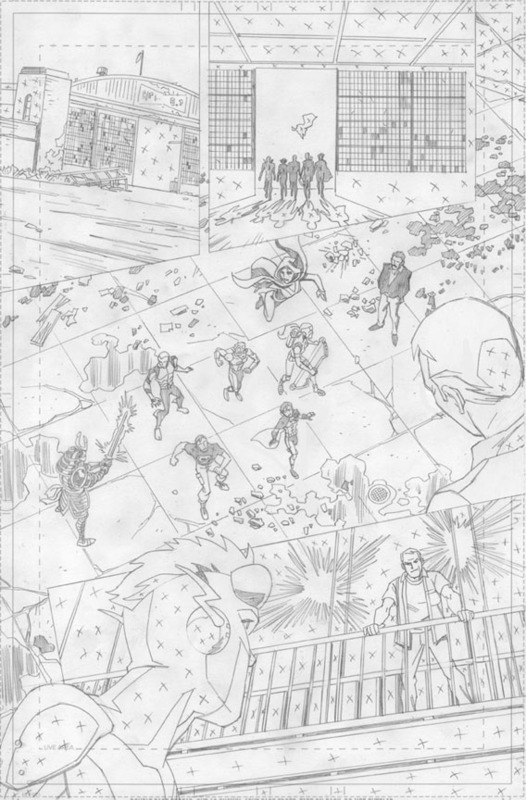 Page 17: Almost all of the imagery from what Kid Flash is describing hear had appeared previously in flashbacks in the previous issue, but this time I have the convenience of placing them within panel borders. Page 18: The last of the holo-displays from this 2-parter. Whew! Page 19: What??? Captain Atom IS Captain Nathaniel Adams? I’m shocked, SHOCKED I tell you! Well, that wraps up another one. Check back in about a month’s time for a Commentary on Young Justice #11, featuring Batman, Ra’s al Ghul and Talia! I’d love to hear from you if you find this kind of detailed commentary interesting. Drop me a note in the comment section below! 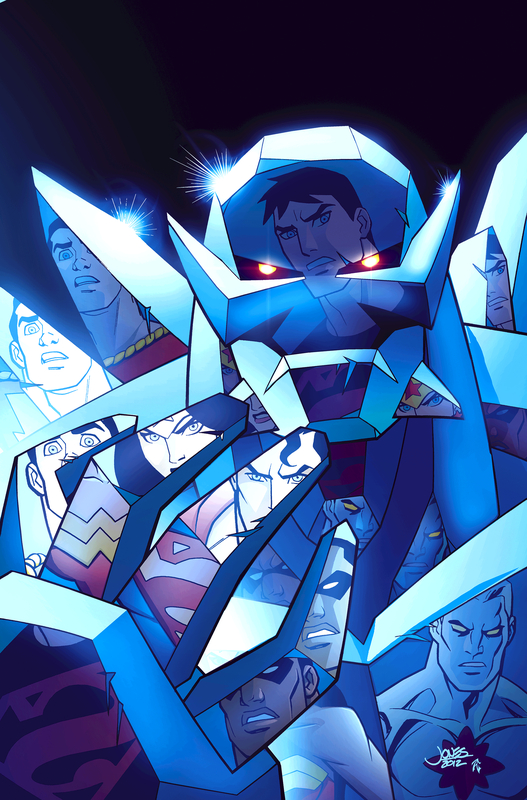 Young Justice #10 is OUT TODAY! 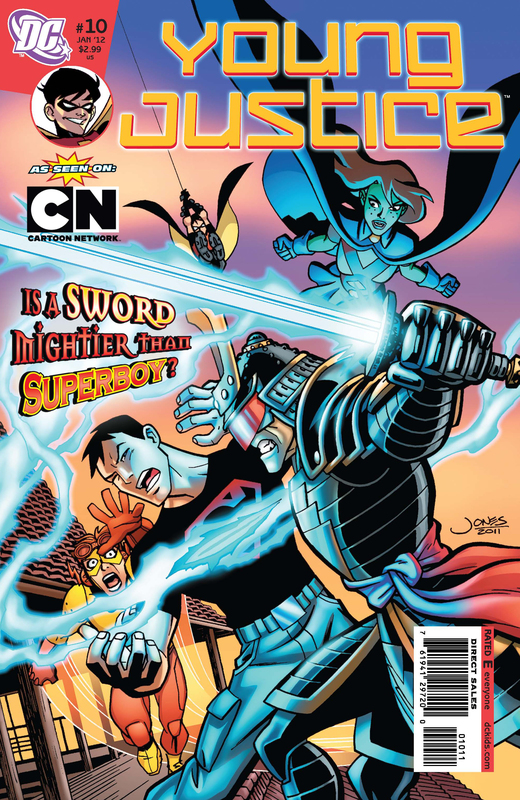 …and DC Comics has a 4-page preview on line! 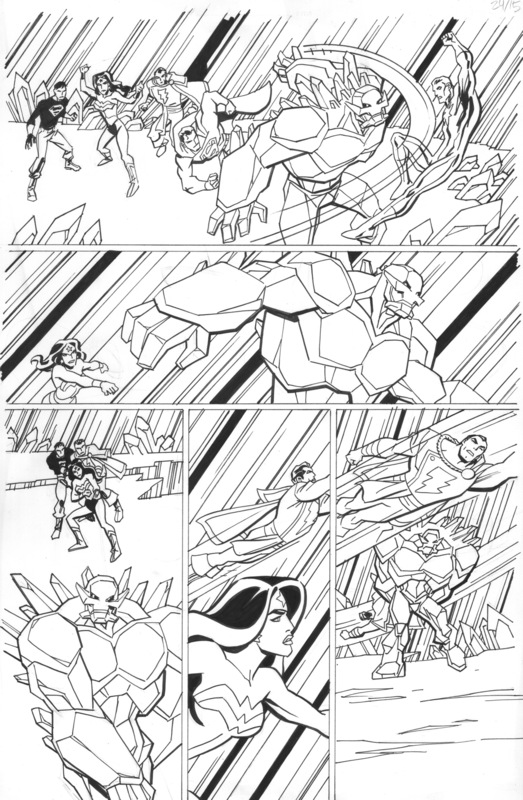 Story by Greg Weisman and Kevin Hopps, artwork by myself and inker Dan Davis. Check it out here, and then pick up the comic in digital form or at your local comic shop! 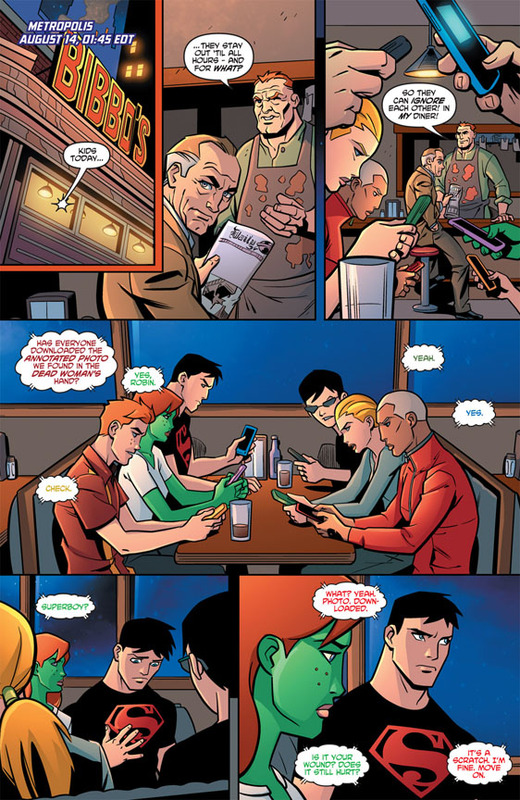 Young Justice | Christopher Jones | November 16, 2011 1:49 pm | Comments Off on Young Justice #10 is OUT TODAY!